KRIS AQUINO said quite a mouthful at the presscon of “I Love You, Hater” that she easily eclipsed her young co-stars in the movie and turned the presscon in a Kris Aquino Show. She obviously missed being the star in a presscon like this and she really prepared for it, even attending it with her own staff and crew to record everything for her digital show. Her co-stars in the movie, Joshlia, willingly took the backseat for her to shine fully. 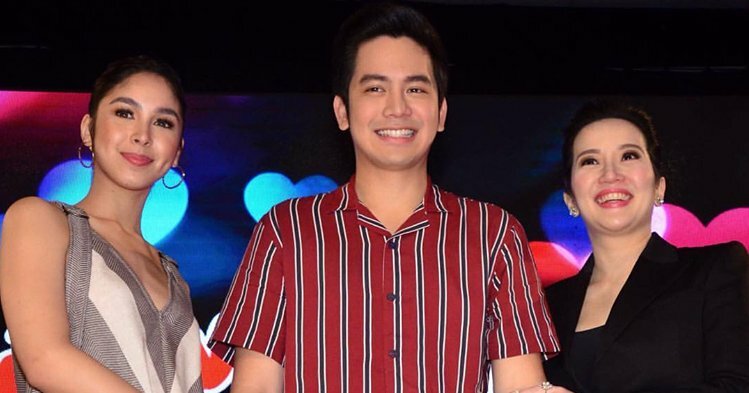 Her son Bimby accompanies her to the shooting of “I Love You, Hater” and saw how much Joshua Garcia takes good care of his partner Julia Barretto. Because of this, he gave her mom permission to have a new boyfriend. It’s very obvious she still carries the torch for Mayor Herbert, who can now very well deliver the title of her movie for her, “I Love You, Hater”. When asked if she could possibly fall in love with Joshua Garcia if she’s the same age as Julia Barretto, her reply is: “Joshua, don't hate me, ha. Sorry ABS-CBN, don't hate me for this answer—si Alden Richards ang pipiliin ko. Sorry po. I apologize. No offense to everybody here. Huwag kayong magalit sa akin. Pero kasi ang kay Julia, kay Julia na. Si Alden, libre pa."